Halifax coach Richard Marshall is one of three names on the shortlist for the Championship Coach of the Year prize. The rookie boss, who steered Fax to a shock fourth-placed finish in his first season as a head coach, has been nominated alongside Leigh’s Paul Rowley - his former Fax teammate - and Whitehaven’s James Coyle. 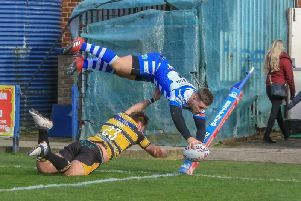 Fax skipper Scott Murrell’s outstanding form has also been recognised, with the talented playmaker on the list for the Player of the Year gong, alongside Leigh’s Ryan Brierley and Bradford’s outstanding half back Lee Gaskell. Marshall described the nominations as a “great accolade for the whole squad”. The winners will be crowned at Monday night’s Championship awards dinner in Manchester. League 1 Coach of the Year: John Duffy (Swinton Lions), James Ford (York City Knights), Scott Naylor (Oldham).